To coincide with the opening of an exhibition dedicated to plywood at London's V&A museum, we've rounded up 10 projects from the Dezeen archives that push the material to its limits. Plywood: Material of the Modern World charts the history of plywood from the 1850s to present day, showcasing examples of how the material has contributed to significant developments in the design industry, from transport to housing and furniture. Objects on show range from planes to skateboards, to now-iconic furniture designs by Ray and Charles Eames, Alvar Aalto and Marcel Breuer, and innovative high-rise housing built with one of the most high-tech forms of plywood – cross-laminated timber. 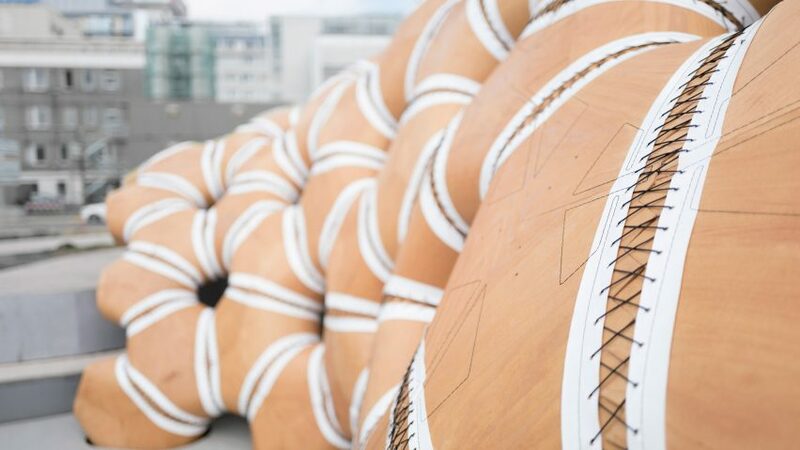 This pavilion by researchers and students from the University of Stuttgart was constructed by an army of robots, which moulded and stitched together sections of laminated plywood to create a structure based on the anatomy of a sea urchin. To create the shell of this chair, design duo Färg & Blanche used a heavy-duty sewing machine more commonly used for making cars to stitch together sections of tonal plywood. These ice-skating shelters by Patkau Architects are on show as part of the exhibition in the museums John Madejski Gardens. Each was constructed from two layers of flexible plywood attached to a timber frame, with a timber floor and plywood seating inside. For this year's Clerkenwell Design Week, London designer Giles Miller created a pavilion made from 8,000 lightning-bolt-shaped pieces of plywood. The black-painted shingles were placed by hand onto the structure, with each angled specifically to control the amount of light that entered the pavilion. When the team from the University of Stuttgart created the Landesgartenschau Exhibition Hall, they claimed it to be the first building to have its main structure entirely made out of plywood panels created by robots. The team has since gone on to construct a number of pavilions using similar methods, but this one was made from 243 different plates of plywood that were created using a robot. While the plywood furniture made by Opendesk is simple in form, it is the company's open-source on-demand service that makes the application of the material most innovative. Last year, it launched a service aimed at disrupting the contract furniture industry, allowing businesses to order locally manufactured products that can be delivered and installed in just 14 days. This egg-shaped hut built by Danish studio SHJWorks sat on the edge of a Copenhagen park, giving passers-by a warm place to rest around a fire. It was constructed by bolting sheets of flexible plywood together using CNC-cut strips of white polycarbonate inspired by the stitches in clothing. Plywood was used by Takashige Yamashita to create the dramatic undulating roof of this nursery in Japan's Yamanashi prefecture. The laminated-veneer-lumber rafters are sandwiched between layers of structural plywood to add rigidity to the overall roof structure and ensure it is able to achieve spans of up to ten metres. When London designer Benjamin Hubert created Ripple, he claimed it was the lightest timber table in the world. The table, which is 2.5 metres long, one metre wide and weighs just nine kilograms, was made by corrugating three layers of 0.8 millimetre-thick birch plywood. This eight-storey apartment block in Stockholm is made up from prefabricated modules of cross-laminated timber (CLT), which is similar to plywood in its make-up and formed by glueing together several layers of lumber at right angles to each other. When it completed in 2015, it was one of the first examples in the world of high-rise construction using CLT.